Beyond the patio, the view toward the stuccoed garage takes in bougainvillea. 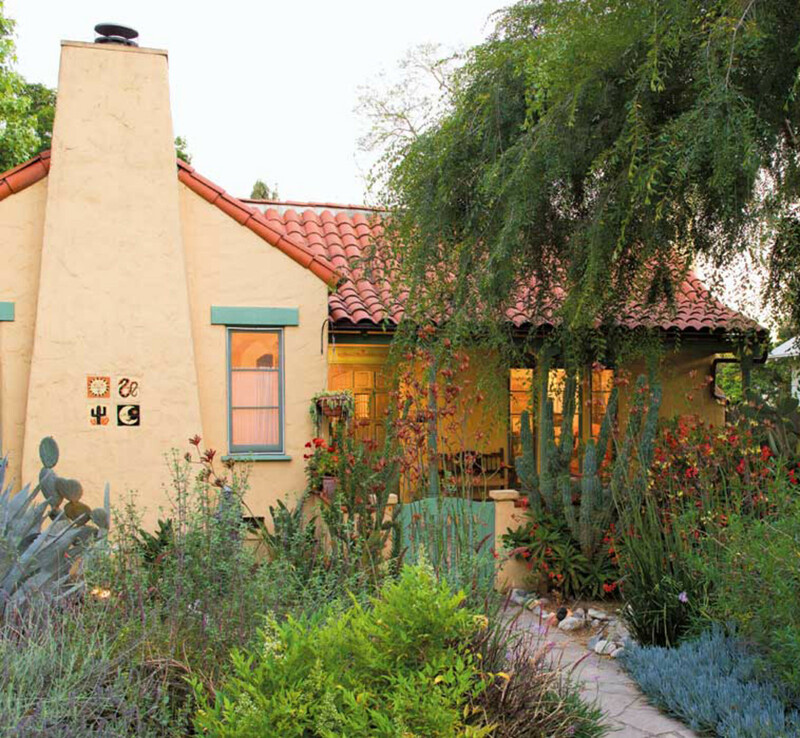 When they saw the property for sale in 2004, these Pasadena homeowners were as attracted to the unusual gardens as they were to the Spanish Colonial-style bungalow. 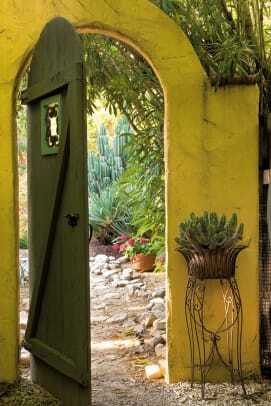 The entry was flanked by an otherworldly pair of spiny, six-foot-tall agave, and exotic succulents beckoned behind the gate. 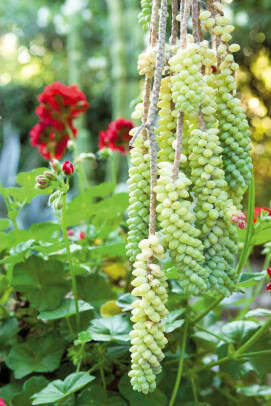 Fifteen-foot-long arms of a Euphorbia candelabrum towered over the red-tile roof. Bold color was everywhere: in the blood-red crown of thorns (Euphorbia milii), in the seven-foot-tall, hot-orange lion’s tail (Leonotis leonurus). Over these spread an established Chinese elm. The house was built in Brentwood in 1926 as a secret gift from a silent-screen star to his mistress. By the late 1980s, the once-charming bungalow faced demolition. Recognizing its history, previous owners had donated it to Cal State, who dismantled and stored it until 1991, when a couple of artists bought it and moved it to a palm-lined boulevard in Pasadena. They meticulously restored the house, including its stenciled ceilings and the fireplace of blue Malibu tiles. 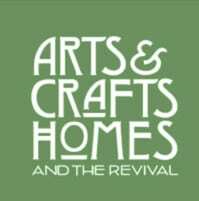 They painted the stucco a golden peach; inside, rooms were treated to a Mexican color palette with clear blues, yellows, and oranges inspired by artist Frida Kahlo’s Casa Azul. Bold forms and color flow inside and out, but the exotic property has a soothing integrity, the result of a strong design vision. The next owners honored that vision. An exotic mix of drought-tolerant plantings borders the walkway to the bungalow: ice plant, lion’s tail, cereus, crown of thorns. A Chinese elm provides shade. Incorporating cacti and succulents, the gardens were designed to be drought-tolerant. The front walk sets a desert tone with those enormous agave sentinels. 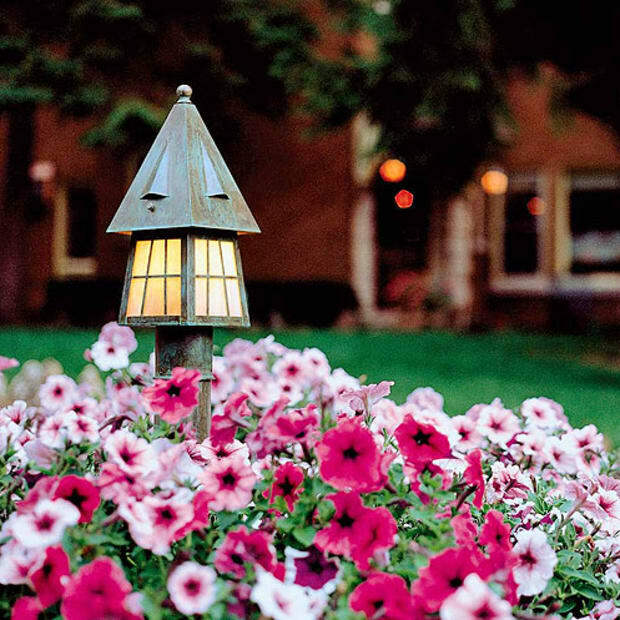 Within the strong architecture of the garden plan, the front yard is planted with delightful chaos. Fragrant yellow angel’s trumpet (Brugmansia) and the sprawling Chinese elm provide a partial canopy during the hot summers. 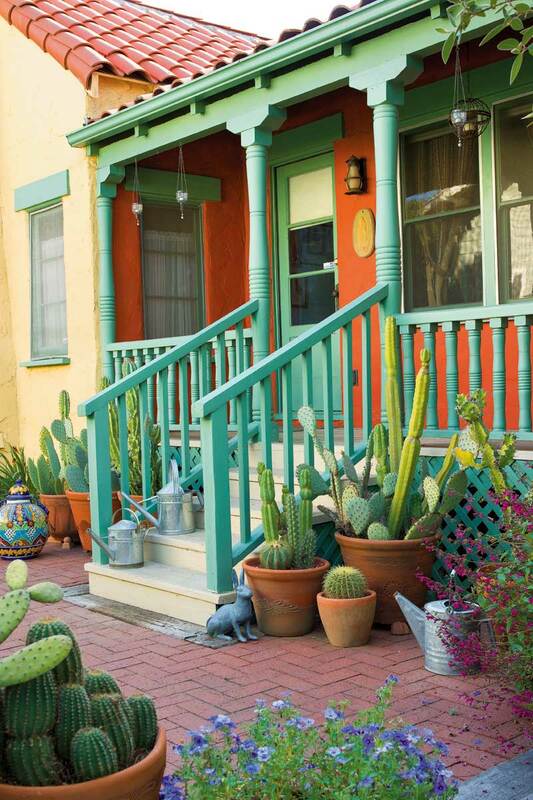 The exuberantly colored side porch opens onto a brick patio crowded with potted cacti. Profusely blooming oleander clambers over the top of a storybook archway on the east side of the house. A weathered wooden gate opens to the shady east side yard, which is planted with sweet-smelling gardenias, cheerful dahlias, and an enormous magenta-purple bougainvillea. The rear of this Spanish bungalow garden has been divided into three rooms. 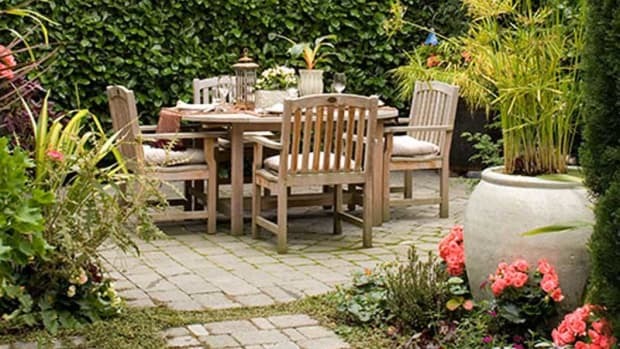 A flagstone patio off the back of the house is a pleasant retreat with Adirondack chairs set for contemplation of a small pond and fountain bordered by lantana and rosemary. 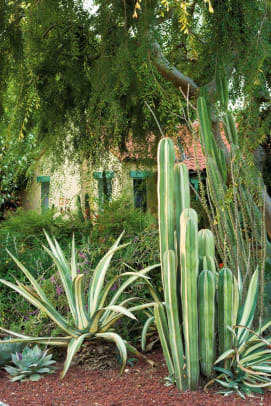 A cacti and succulents garden on the west side is dominated by a 12-foot Lophocereus montrose, and bordered with prickly pear (Opuntia), Euphorbia grandicans, aloes, and the gnarly stems of Myrtillo- cactus. Finally, nine citrus trees make a sunny grove in back. 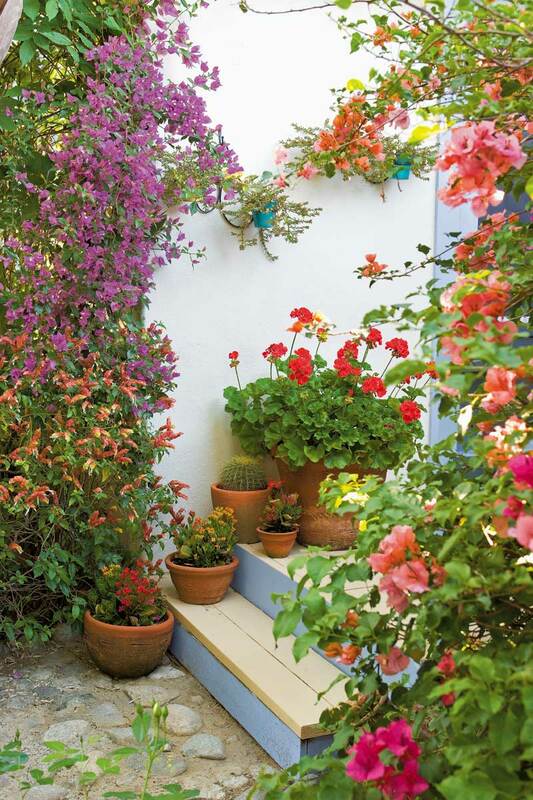 Steps to the casita (a guest house turned writing studio) are lined with pots of geraniums, kalanchoe, and cacti. Multi-color bougainvillea climbs the railing and walls. 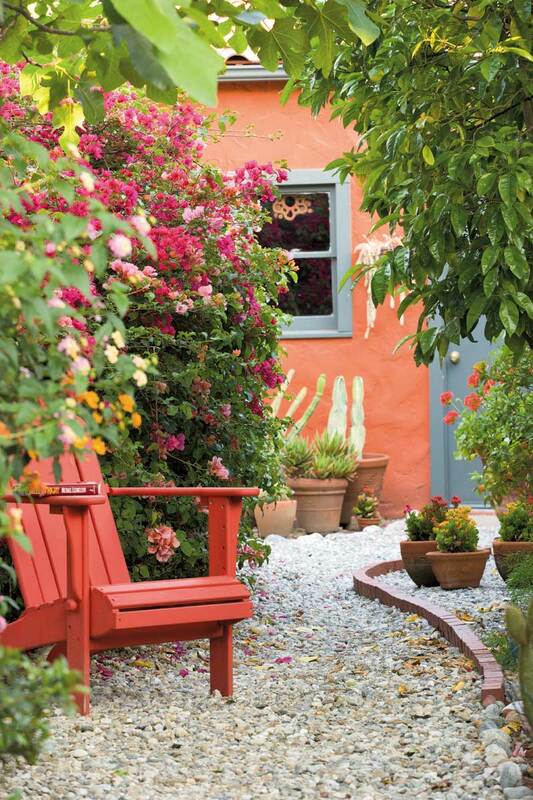 These owners refined the Southwestern Spanish bungalow garden—using statuary to create focal points, putting out pots for seasonal color, and adding gravel to dirt paths that used to turn to mud during winter rains. They took out raised beds in the rear, creating instead a vista down the center of the yard, seen through an arched trellis. 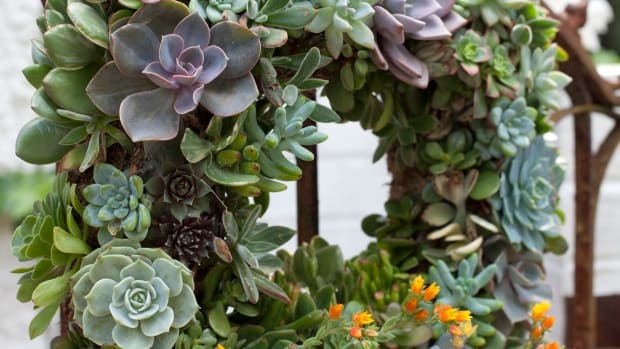 Incorporating cacti and succulents, the gardens were designed to be drought-tolerant. a Even a cactus needs maintenance, of course, and the owner–gardener reports that vigilance is the key. He counsels weekly inspections to remove dirt and cobwebs from spines, and he doesn’t hesitate to prune a leggy plant. (Leather gloves are mandatory!) 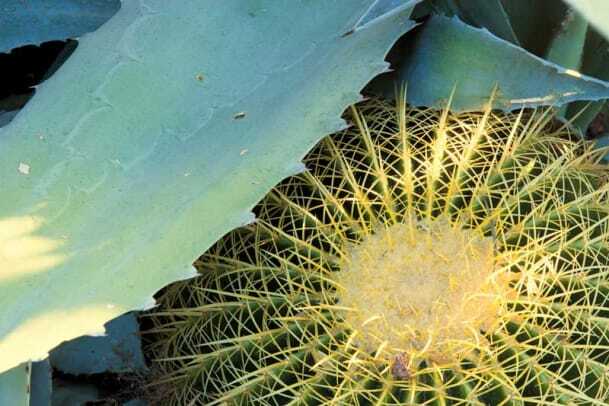 a For both beginners and more experienced gardeners, the homeowner recommends Miles Anderson’s World Encyclopedia of Cacti and Succulents as an invaluable resource. 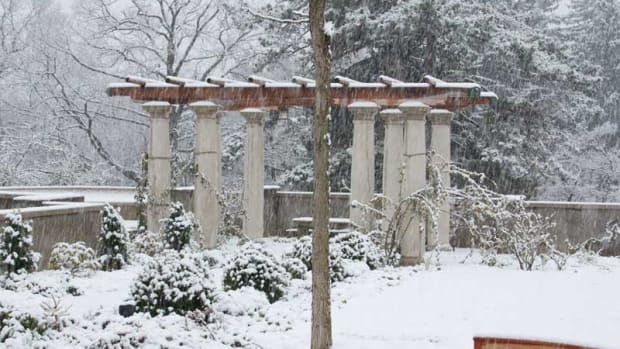 A strong underlying architecture is important when the garden goes minimalist for the winter.